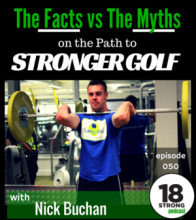 On this week’s show we talk to Nick Bucher, a certified strength trainer who specializes in training golfers of all ages and abilities. Do you have to work out to be a good golfer? How much training is too much? We talk to Nick about these and many other topics. Whether you want to hit 300 yard drives or just make it through all 18 without hurting yourself, Nick has some tips and techniques you need. Also, Brooke Pancacke and Johnny Vegas have the wrong sponsors. We suggest how to fix that. Join John Ashton and Jeff Smith for another fun, funny and very entertaining hour of Golf Talk on Those Weekend Golf Guys Podcast.